I installed the latest Office 2011 update and now I can’t open Outlook. When I try I’m told that I must update my Office database. I do that and some tool appears that updates my identity. When it completes I’m then told that there’s a problem with the Office database and I have to rebuild it. Okay, so I do that and then I’m told that my identity is older than the version of Outlook that I’m now using. The solution is to launch Outlook to rebuild the identity, but when i do that, the loop starts over. Help!! I wish you were the only affected party, but I’m afraid you’re not alone. I encountered the same problem as I’m sure many others did (particularly given that Microsoft issued a support document the same day the latest upgrade shipped that explains the way out). This is a document you should read as it outlines every inconvenient step you must take to make Outlook usable again. For those non-Outlook-using readers following along who take some pleasure in the discomfort of others, here’s the gist. First, you quit Outlook. Then, locate the Office 2011 Identities folder, found via this path—youruserfolder/Documents/Microsoft User Data. Duplicate the Office 2011 Identities folder. (My folder included more than 650,000 items that consumed 20.6GB of data. It took nearly 50 minutes to duplicate.) This is simply a backup copy should something go wrong. Now that you have a backup copy, launch Outlook while holding down the Option key to open the Microsoft Database Utility. In that window click the Plus (+) button to create a new identity—it will be called Identity 1 by default. Don’t set this identify as the default and close the utility window. 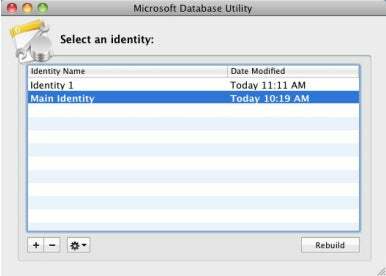 Return to the Microsoft User Data folder inside your Documents folder, open the original Office 2011 Identities folder, and seek out the Identity 1 folder. Open this folder and then open the Data Records folder within. While holding down the Control key click on the Database Headers folder and choose the Copy Database Headers command from the resulting menu. Return to the Office 2011 Identities folder, open the Main Identity folder, and open its Data Records folder. Choose Paste Item from the Finder's Edit menu and then click Replace All in the alert that appears. Not done yet. Now, launch Outlook with the Option key held down to open the Microsoft Database Utility. Choose the Main Identity (or whatever you’ve called your main identity) and click the Rebuild button. If you have a lot of items the rebuild process can take a very long time—time you might devote to thinking about moving to a different email client that doesn’t demand this kind of rigmarole. Once the database has been rebuilt you can go back to using Outlook. Update: Microsoft has pulled the SP2 update for the reasons cited in this article. Updated 4/23/12 9:40 AM Added note about Microsoft pulling the update.